Daikin air cooled chillers have been the choice for system designers who are focused on simplicity and low cost. A system based on air-cooled chiller usually is less expensive to install and easier to maintain then other types, such as water-cooled systems. 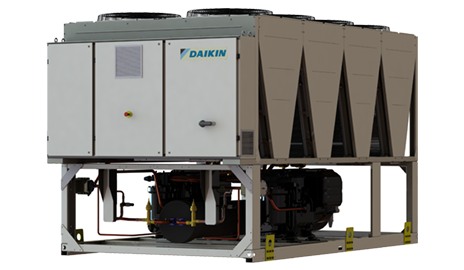 Daikin makes a complete line of air-cooled chillers with a variety of compressor types, to match both your application and budget. Sizes range from 35 kW to 2000 kW. Large air-cooled chillers provide an economical means to produce chilled water without the requirement for a cooling tower, avoiding additional system complexity and maintenance.